No one has been more responsible for the recent explosion of interest in bone than New York City chef Marco Canora. 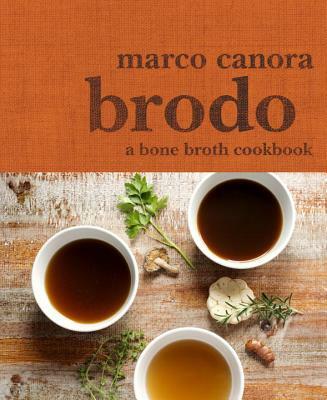 After completely revitalizing his health by integrating bone broth into his diet, Marco began to make his nourishing broths available by the cupful to New Yorkers from a small window in his East Village restaurant, drawing sell-out crowds virtually from the beginning. No longer just a building block for soups and sauces, bone broths are now being embraced for their innumerable health benefits, from cultivating a healthier gut to greater resistance to colds and other illnesses. In Brodo, Marco shares the recipes for his flavorful, nutritious broths and shows how to serve them year round as well as incorporate them into recipes and as a daily health practice. Perfect for stirring into a broth bowl or a pot of risotto, as a more gentle, supportive alternative to the afternoon caffeine fix, and an immunity and health booster any time, the homey bone broths in Brodo should be a part of every well-stocked pantry. As a chef, restaurateur, and cookbook author, MARCO CANORA has been doing his part to promote delicious, simple, and healthful food. He is the restauranteur behind Hearth, Insieme, and Terroir, has cooked at Gramercy Tavern and at Craft with Tom Colicchio, and is the author of Salt to Taste and A Good Food Day. He was a contestant on Food Network's Next Iron Chef and teaches cooking classes every summer in Tuscany. He lives in New York.